Last week, China delivered some heavy equipment to the Philippines as the Southeast Asian state undertakes a major rehabilitation effort in the southern city of Marawi. 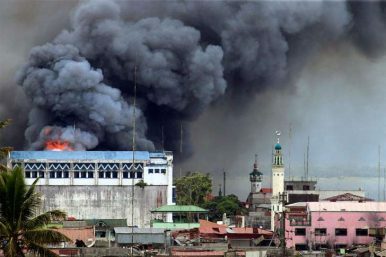 An ongoing conflict in Marawi between Islamic State-backed militants and government forces had erupted back in May and is set to end soon. The development was yet another sign of Beijing’s growing security ties with Manila, a longtime U.S. treaty ally, under President Rodrigo Duterte. As I have noted previously, though the Philippines has traditionally not had much in the way of a security relationship with China, Duterte’s pursuit of a so-called independent foreign policy – which seeks to diversify ties away from Manila’s traditional ally the United States and toward other new partners like China and Russia – has opened the door for better ties between Manila and Beijing, including in the security realm (See: “The Limits of Duterte’s China-US Rebalance”). The crisis in Marawi has no doubt served as a catalyst to speed up the operationalization of ties between the two sides (See: “Why Has the Philippines Struggled in its Terror Fight Under Duterte?”). And though the headlines tend to focus on the military assistance that China has been providing the Philippines – the second batch of which was dispatched on October 5 – it has also been contributing a modest amount of humanitarian assistance as well (See: “What’s in the New China Military Aid to the Philippines?”). For instance, back in June, Chinese Ambassador to the Philippines Zhao Jianhua handed a 15 million peso check to Duterte to support relief and rehabilitation in Marawi. Though Beijing’s assistance was dwarfed by that of Manila’s traditional partners like the United States and Australia, the Duterte administration nonetheless called it an “example of the flourishing partnership between the two countries” (See: “US Terror Aid to Philippines Signals Enduring Defense Ties Under Duterte”). On October 12, the Philippine government officially announced that 47 sets of heavy equipment from China had been turned over to the Department of Public Works and Highways (DPWH) for utilization for the rehabilitation of Marawi City. The equipment, shipped from Shanghai to Iligan, included eight excavators, eight wheel loaders, five compactors, five track type tractors, five bulldozers, eight dump trucks, eight cement mixers, and a unit of container van. They were dispatched by Beijing through its Emergency Humanitarian Assistance Program. The Philippine government said that the heavy equipment will be used for the construction of shelters for internally displaced persons (IDPs) of Marawi. Philippine officials also added that they were expecting more sets of equipment to arrive from China in addition to the current round of aid. As the Marawi crisis comes to an end and the focus shifts to reconstruction, we can expect Beijing to continue to highlight its role in this aspect of relations even as other forms of defense cooperation also strengthen as well. What’s in the New China-Philippines Defense Industry Pact?What’s Next for China-Philippines Military Ties?Singapore Gives Philippines Military Aid to Fight Islamic State ThreatAustralia’s New Philippines Counterterrorism Role Takes ShapeWho Will Be the Philippines’ Next Military Chief?